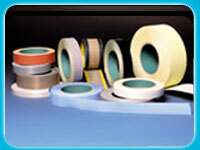 PTFE Tape -Polytetrafluoroethylene (PTFE), is an engineering plastic known for its low coefficient of friction, inertness to chemicals, and resistance to heat. With a low friction surface second only to ice, PTFE also boasts outstanding electrical, insulative and dielectric properties. When coated onto a fiberglass fabric, it becomes dimensionally stable and durable. Conductor - nickel-coated / silver-coated / tin-coated / bare copper. PTFE Insulated Multipair Cable -These PTFE Multipairl cables can withstand a wide temperature range from -65 Degree C to + 250 Degree C. They are chemically as well as environmentally stable. They match the requirements as per JSS-51100/MII-C17. PTFE co-axial cables (RF CABLES) are for use in Military, Telecommunication & other High reliability Equipments. PTFE Insulated Multicore Cable -Our range of PTFE multicore cables is available in competitive prices. These cables is manufactured using superior grade alloys and other raw materials. These cables are in accordance with various Indian and international quality standards. PTFE Insulated R.T.D.Cable -Our range of PTFE R.T.D. cables is available in competitive prices. These cables is manufactured using superior grade alloys and other raw materials. These cables are in accordance with various Indian and international quality standards. PTFE Insulated Co-Axial Cable -These PTFE co-axial cables can withstand a wide temperature range from -65 Degree C to + 250 Degree C. They are chemically as well as environmentally stable. They match the requirements as per JSS-51100/MII-C17. PTFE co-axial cables (RF CABLES) are for use in Military, Telecommunication & other High reliability Equipments. PTFE Insulated Thermocouple Cable -A pair of different Thermocouple wires ( e.g. ) Ni - Cr, Ni - Al, Iron - Constantan, Copper - Constantan, NICR - Constantan etc ( As per DIN - 43760 Standards ) is made in twin flat or round form to make Thermocouple leads being used for accurate temp. measuring and controls. The wires may be designed and manufactured as per customers specific requirements. PTFE Insulated H.R.Cable -These PTFE insulated H.R.cables can withstand a wide temperature range from -65 Degree C to + 250 Degree C. They are chemically as well as environmentally stable. They match the requirements as per JSS-51100/MII-C17. PTFE co-axial cables (RF CABLES) are for use in Military, Telecommunication & other High reliability Equipments.